Some 1,400 people living in France have joined or plan to battle alongside militants in Syria and Iraq, Prime Minister Manuel Valls said. The number of French jihad followers has risen by at least 200 people in the past month. "There are 1,400 individuals who are involved in the departures for jihad, for terrorism, in Syria and in Iraq," Valls told BFMTV. "There are close to 70 French citizens or residents in France who have died in Syria and Iraq in the ranks of the terrorists," he added. In December, French Interior Minister Bernard Cazeneuve told the nation's parliament that around 1,200 French citizens had left to fight alongside Islamists, and 390 were members of radical groups in the region. "It is a massive jump in very little time: there were just about 30 cases when I became interior minister [in mid-2012], and 1,400 today," said Valls. Following the terror attacks in which 17 people were killed by gunmen in Paris last week, French authorities remain on high alert. Officials said that Paris will deploy 10,000 soldiers on home soil by Tuesday and post almost 5,000 extra police officers to protect Jewish sites by Tuesday. French-born brothers of Algerian origin Cherif and Said Kouachi launched an attack on the Charlie Hebdo HQ after several publications were released containing cartoons that ridiculed the Prophet Muhammad. 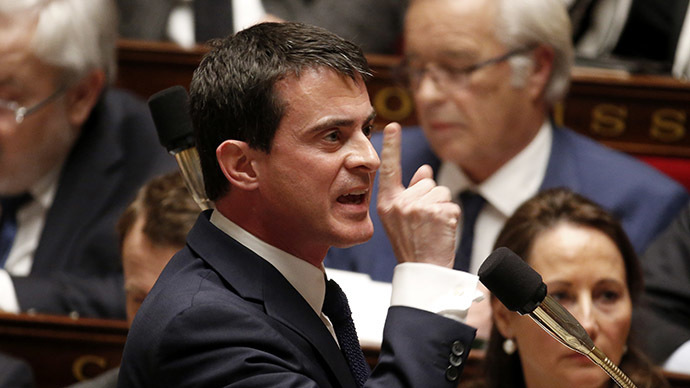 Meanwhile, on Saturday, Valls said that Paris has declared war against “radical Islam, against terrorism, against jihadism.” The comment was made during a speech in Évry commune, in the southern suburbs of Paris. Volunteers to fight alongside Islamic State militants have been flocking to Syria and Iraq from all over the world. France, Germany, and the UK account for the largest number of citizens from European countries fighting alongside militants in Syria, according to a report from the International Centre for the Study of Radicalisation (ICSR) in 2014.